Applying Positive Psychology in organisations is key to increasing the performance of teams and the satisfaction of individual team members. Whereas traditional psychology looked at what didn’t work and why, Positive Psychology focuses on what works and how to develop more effective ways of being and doing. This seems to me to be a much better way to help managers improve the performance of their teams and in early 2010 I embarked on a series of talks at venues all around the UK. BONUS – Audio Recording of the presentation (32 minutes) – available as MP3 to download or listen to online. All this is available to you for a very reasonable £9.97 (+VAT). If you’re an Executive Coach, Counsellor, Psychotherapist, or Psychologist looking for a simple and elegant model to use with your corporate and organisation based clients, ‘Positive Profits’ provides powerful techniques you can put into practice straight away. Click on the link below to get your copy now. 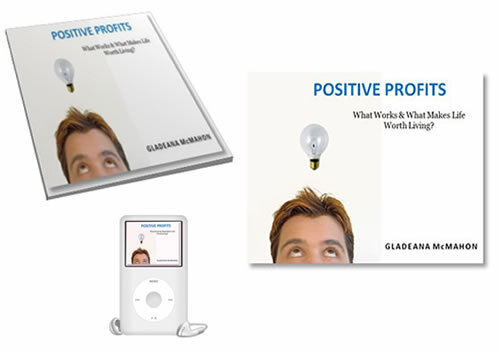 ‘Positive Profits’ comprises 3 digital downloads (2 pdf files and 1 MP3 audio). Once your order has been processed, you’ll be directed to a confirmation page. The link to the download page will follow shortly afterward by email.